Asymmetric reconnection is being investigated by means of particle-in-cell simulations. The research has two foci: the direction of the reconnection line in configurations with nonvanishing magnetic fields; and the question why reconnection can be faster if a guide field is added to an otherwise unchanged asymmetric configuration. We find that reconnection prefers a direction, which maximizes the available magnetic energy, and show that this direction coincides with the bisection of the angle between the asymptotic magnetic fields. Regarding the difference in reconnection rates between planar and guide field models, we demonstrate that a guide field can provide essential confinement for particles in the reconnection region, which the weaker magnetic field in one of the inflow directions cannot necessarily provide. Magnetic reconnection occurring in collisionless environments is a multi-scale process involving both ion and electron kinetic processes. Because of their small mass, the electron scales are difficult to resolve in numerical and satellite data, it is therefore critical to know whether the overall evolution of the reconnection process is influenced by the kinetic nature of the electrons, or is unchanged when assuming a simpler, fluid, electron model. This paper investigates this issue in the general context of an asymmetric current sheet, where both the magnetic field amplitude and the density vary through the discontinuity. A comparison is made between fully kinetic and hybrid kinetic simulations of magnetic reconnection in coplanar and guide field systems. The models share the initial condition but differ in their electron modeling. It is found that the overall evolution of the system, including the reconnection rate, is very similar between both models. The best agreement is found in the guide field system, which confines particle better than the coplanar one, where the locality of the moments is violated by the electron bounce motion. It is also shown that, contrary to the common understanding, reconnection is much faster in the guide field system than in the coplanar one. Both models show this tendency, indicating that the phenomenon is driven by ion kinetic effects and not electron ones. I had the pleasure to receive the award “René Pellat” from the french society of Physics (Société Française de Physique, SFP) for the work done in my PhD. 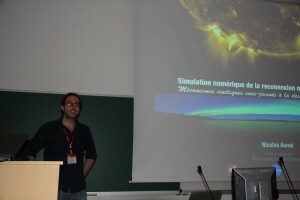 In May 2012, I was invited to give a talk at the 12th meeting of the plasma division of SFP, in Orléans, France.